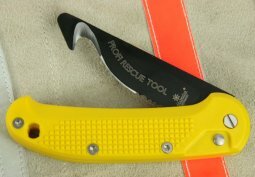 Pocket knives are a great invention: they are handy and the blade is in safe position when closed. 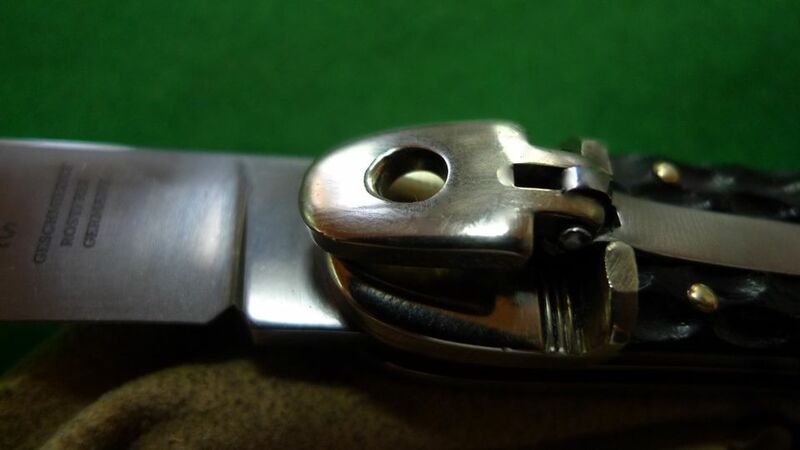 Anyway many owners know, that it is quite often a pain to open them manually, and if you have just one hand available, it is nearly impossible to get them in a working position. This nuisance may have been the reason that knife makers from Solingen invented a mechanism to operate a folding knife by only one hand. 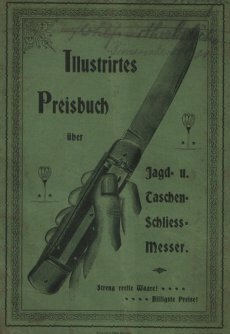 It is impossible to research the history of German switchblade knives in detail. For a long time, no one took care of records, and several wars on the European continent have destroyed documentation. The German switchblade knife is no “new” development, or a trend - which just started in the 1950’s. That post World War II period is the successful start of popular stiletto knives only, mass imported from Italy at reasonable pricing. 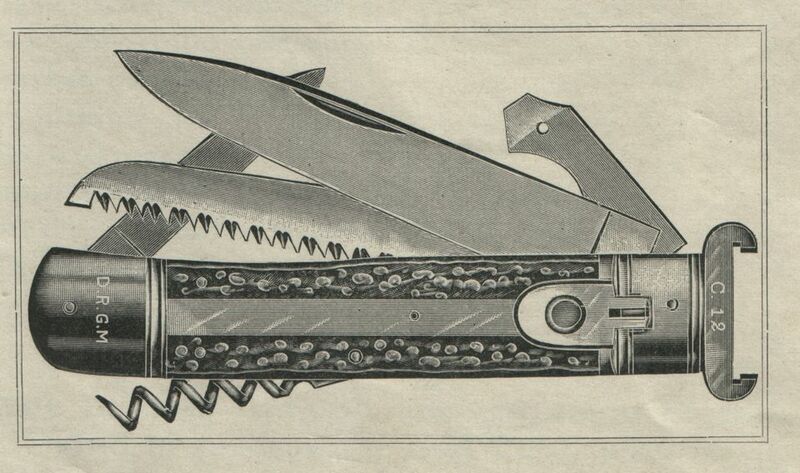 100 years before, around 1850, some well renowned Solingen steelware companies use the wording “Aufspringmesser” in their sales catalogs, the German word meaning “knife to spring open”. “Springmesser”, i.e. spring knife, was used in the 1850’s also, and quickly became the more popular term for this style of knife. Both at that time until the mid 20th century knives were the main tool for daily life. Cutting duties had to be done every day and in many different tasks. To facilitate handling of a pocket knife was highly desirable and necessary for many users. Industrialization caused new techniques of manufacturing and enabled creative innovation, to manufacture economically in series and to market at reasonable pricing. German switchblade knives were manufactured as one bladed cutting tool or multi bladed with various different components. Hunters preferred patterns with additional saw blade, gutting blade or cartridge extractors which were available in many different styles, fitting to the different patterns of cartridges. Besides such practical tooling, some users preferred exclusive materials or outstanding designed switchblade knives. A very early piece is illustrated in a small German booklet, printed in 1868. It is titled “Atlas zur Fabrikation der Stahl-Waaren” (“Digest of Steelware”), and the sub-title says: “Manufacturing of knives, forks, scissors, sabres, daggers etc., as made in particular in the city of Solingen”. There is shown a wavy / kriss bladed “dagger switchblade”, featuring a handle highly detailed and crafted out of genuine ivory, with bottom and top bolsters including a crossguard of outstanding, shell style design. 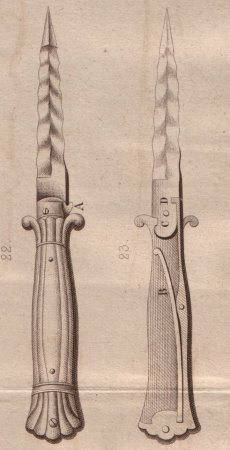 A cutaway of that knife is illustrating the technical detailing of backspring and locking mechanism of the blade, and a flick spring which is similar to the common ones. 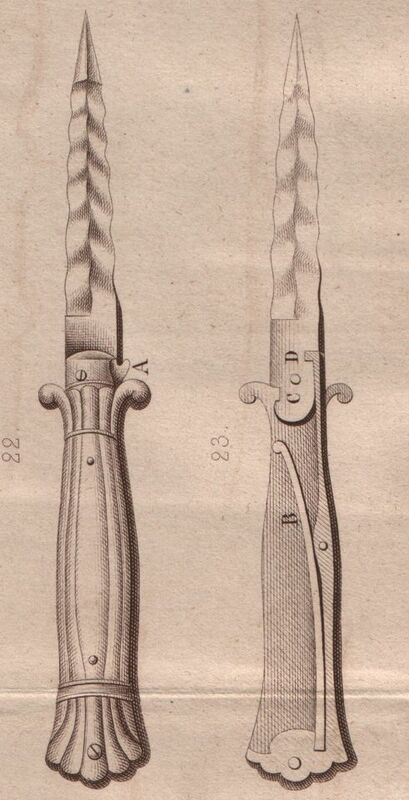 Around 1880, several Solingen knife manufacturers created new release mechanisms for switchblade knives, and requested / registered patent rights (DRP – Deutsches Reichspatent) or utility design rights (DRGM – Deutsches ReichsGebrauchsMuster). These rights, or patents, did not prevent that Springmesser could be marketed successfully. Obviously they caused further research for more improvements and design changes. In 1897 the German Patent office in Berlin granted a DRGM - utility design to a Solingen knife maker for his invention of a “ release with a folding lever, which works as a safety," to prevent accidental opening or closing. This mechanism is commonly known as the "lever lock." Lever lock switchblade knives became most popular in Germany immediately, but even more new release and locking mechanisms were invented during the following years, and more than 30 different ones used by Solingen manufacturers are known today. Manufacturing and marketing of “Springmesser” was not limited to a few Solingen knife manufacturers. From 1900 to WWII nearly all leading Solingen cutlery manufacturers or wholesalers offered switchblade knives to their customers. More than 80 different trademarks or brand names are known and prove the importance and popularity of such knives. They were not only marketed in Germany or on the European continent, but were exported worldwide with great success: into all Netherland colonies, even to Russia, China, Africa, South Middle and North America. “Made in Germany” became a great reputation during the last century - cutlery and switchblade knives “made in Solingen” probably supported that outstanding reputation of German products! After WW II was devastating for Solingen’s knife industry. Many companies were destroyed, machinery and dies had been lost and just a few knife manufacturers remained in business. Some of them co-operated with US importers successfully and re-started manufacturing classic switchblade knives under contract with their customers’ US-trademarks or exported their own brands, but the US switchblade act stopped such business in 1958. Thus just a few makers carried switchblade knives in their range after that date. Though German laws restrict switchblade knives since 1968 and another even stricter new law banned further knives in 1972 and in 2004, the manufacturers had a good market for high quality semi-handcrafted switchblades. New trends caused by custom knife makers became popular in the mid to end of the 1980’s: hand forged Damascus blades were demanded and exclusive handle material was reintroduced. In the Mid 1990’s, CNC machine crafting enabled to make knives without liners, coil spring activated switchblade knives caused the re-introduction of the press-button as a release. 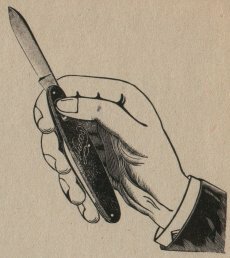 The button style of release was used in Germany at least 75 years before in Germany’s capital of cutlery already: Some manufacturers’ sales catalogs or advertisements illustrate pocket knives with a button release others even with an additional sliding safety during the 1920’s. The last German weapon law changes effective April 2003 and 2008 had new restrictions, such as banning Balisong butterfly knives, gravity knives and front opening switchblade knives. 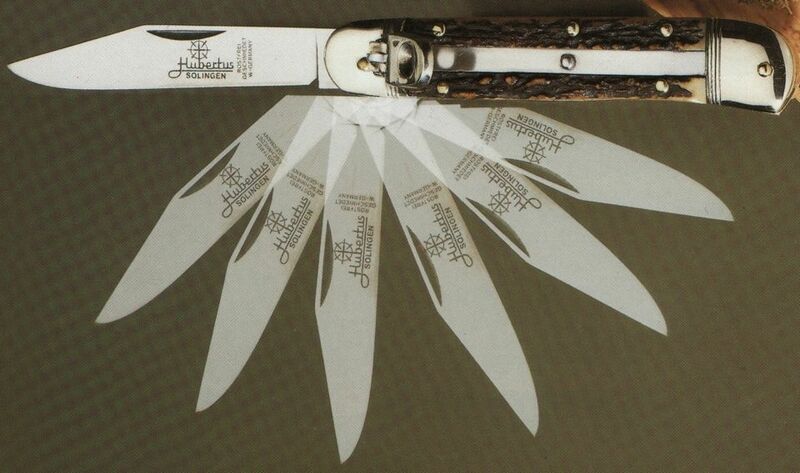 Side opening switchblade knives are legal, unless the blade length does exceed 8.5 cm / 3.35". The width in the mid of the blade had to be minimum 20% of the blade length for a few years but that restriction finally was deleted. Such restrictions made some makers sell out the remaining stocks or to craft a last production run in order to sell out remaining knives. In any case there remains a realistic chance to develop new patterns and to manufacture and distribute Solingen made German switchblade knives in the future. My sincere thanks to Bill DeShivs who encouraged me to research and who offered his support in translating.